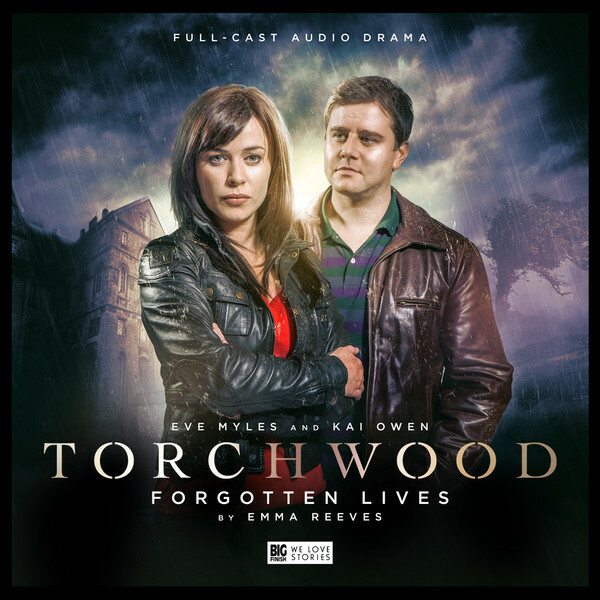 Big Finish: TORCHWOOD: FORGOTTEN LIVES Review | Warped Factor - Words in the Key of Geek. Hope I die before I get old, sings Tony Fyler. Does that look like a heart to you? Or more like an arse? What happened to Torchwood after Miracle Day? What happened to Jack? What happened to everybody’s favourite Welsh couple, the last remnants of the original Torchwood 3? For many people, that’s all you’d have to say to get them screaming to the Big Finish website and pressing the ‘Take My Money And Download Now!’ button. Annnnd I’m not about to say anything to stop them. So go ahead – scream on over there if you like. What you’ll get is another slab of great audio Torchwood: so far, each of the three releases in the Torchwood audio range from Big Finish have told very different stories, in very different tones, and it’s only really by separating these strands out that you begin to realise how very multi-layered the show was. In The Conspiracy, you had Captain Jack, front and centre, undercovering, trying to save lives, revealing an alien plot beneath a popular conspiracy theory and strutting off at the end of the adventure to try and find the source of the danger, with the Torchwood music swelling behind him. In Fall To Earth, you had Ianto Jones, wannabe-spy, undercover and getting things wrong, hurtling into the ground at Holy Crap miles per hour, trying not to die, trying not to kill an awful lot of people in the process and trying, if possible, not to become the world’s most insured dead man. Here in Forgotten Lives, we’re with the bickering heart of the show, Gwen Cooper and Rhys Williams. The slightly disconcerting thing is that while the first two stories are very clearly set pre-Miracle Day, this one takes us five years on from the events of that epic. Jack’s been missing all that time, no mention’s made of Rex Matheson or Esther Drummond, and Gwen and Rhys have been very consciously not doing Torchwood stuff, just busily raising their daughter Anwen and being typical overproud Valleys parents (trust me on this – I know whereof I speak). Then, suddenly one night, they get a call out of the blue. A call from an old lady mostly speaking Welsh. She mentions a name to them. Jack Harkness. Before you can say ‘pre-credits sequence,’ they’re haring off into the wilds of North Wales, to the Bryn Offa nursing home, where the call came from. There they meet a man who claims to be Jack Harkness – only he’s old. Really old. Really old and about to die. They break him out of the home and Torchwood is back in a kind of business. It’s difficult not to spoil the story for you by going further than this. Let’s just say it’s not as simple as it first appears, and people you’d think would be the natural baddies in this scenario have more to them than meets the eye. There’s a vibe in this story that reminds the listener of Countrycide, but there’s more to this story than that one, and we do find out where Jack has been all this time – and what happens to him next. Rhys Williams, welcome to Torchwood…Wrexham. Well, Wrexham By-Pass. As you’d expect from Gwen and Rhys, there’s a lot of great banter in Forgotten Lives, and that special mix that this particular pair of characters excel at bringing to the mix – the domestic and the sci-fi. And while most of it is comedy, writer Emma Reeves does the thing that all more comedy-heavy Torchwood scripts must do at some point – she yanks it out from under you at one point, leaving you sick and cold and terrified for the future of at least a few characters, and possibly for the world. That’s a very distinct moment here, and you won’t fail to spot it when it arrives, because it’s a real chiller. Creepy alien goings-on at an old folks’ home is inherently an unnerving prospect, because it taps into a collective societal guilt that things like ‘old folks’ homes’ exist in the first place – the vulnerability of the old in Western societies, the fate of the frail and the gradual theft of personality inherent in conditions like dementia are very edgy territories for drama. But just as in Children of Earth, Torchwood spared no feelings, plugging human children into alien systems and using them as addictive drugs, so Forgotten Lives hits us hard in our vulnerable areas, with the elderly and the mentally infirm being used as lab rats in some fairly hellish experiments, for a good that will allegedly be greater. Be afraid of those who firmly believe they’re the good guys. Also resonating with Children of Earth, you might not like Jack Harkness very much by the end of this story – his broader view of the human experience gives him attitudes and viewpoints that are hard to reconcile with some of the comfortable fictions with which we generally prefer to surround ourselves. Scott Handcock, directing, has given each of the first three stories a different tone: investigative, panicky, and here, probably the key word is creeping. The realisation of what is going on feels like it’s creeping through the woods of North Wales after you, and when it catches up with you in that bone-chilling moment, you’re going to need a strong constitution to get through it. But it’s a necessary counterweight to the domestic comedy of Gwen and Rhys, giving you a story that you’ll struggle to forget for its central idea, as well as for the return of the couple who are Torchwood’s ordinary, extraordinary heart.